The Township of Rutland was chartered in 1761 by Governor Benning Wentworth of New Hampshire. The first name in the list of proprietors was that of John Murray of Rutland, Massachusetts, who most probably gave Rutland it's name. During the Revolution Murray was a Loyalist. During a raid on Murray's home, a Patriot soldier put his sword through the head in the portrait. The dark hole in the upper left of the head is the result. None of these proprietors ever settled in Rutland. Rather they sold their rights to others such as James Mead who came to Rutland in 1769, built a house and returned with his family in 1770 to become the first permanent settler. From 1770 to 1775 the Rutland settlers who had received their land grants from Governor Wentworth of New Hampshire, were in almost constant conflict with New Yorkers who laid claim to the same territory. In 1775 the American Revolution brought this conflict to an uneasy truce as both faced the challenges of an outside enemy. In 1778 the Americans built Fort Ranger near Center Rutland Falls on property of James Mead. This became the Vermont Military Headquarters for the rest of the Revolution. From 1777 to 1791 Vermont was an independent Republic. From 1784 Rutland was the county seat of Rutland County. In 1792, shortly after statehood, Rutland built a new Courthouse which became the county court and the U.S. Federal District Court of Vermont. For the decade of the 1790s, Rutland alternated with Windsor to host the meetings of the state legislature. Rutland was religiously divided into an east and a west parish. The Reverend Samuel Williams was minister to the east and the brilliant and talented Reverend Lemuel Haynes, a mulatto, was minister to the west. Rutland became home to the Herald of Vermont, a short-lived newspaper published by Anthony Haswell. In 1793 James Lyon published the Farmers Library in Rutland. In December 1794 Judge Samuel Williams of Rutland bought the paper and established the Rutland Herald with the aforementioned Reverend Samuel Williams (no relation) as editor. 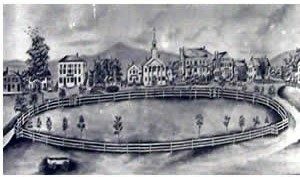 The center of town in the 1790s was on the high plateau at the intersection of Main and West Streets where residents had the benefit of a water system which delivered running water from the hills of Mendon through hollowed wooden logs that served as water pipes. As the Revolutionary generation passed, a new generation of merchants, craftsmen, lawyers and farmers replaced it. As a political change from Federalism to Democratic-Republicanism occurred nationally, so too there was a local change. The west side of North Main Street was the locale for the first Episcopal Church in Rutland and numerous stores and shops. These stores and shops boosted a cash retail economy that would inevitably generate a demand for banking services. In 1824 a Bank of Rutland was chartered as the fourth bank in Vermont. In 1825 a building was erected on the south side of the town common to house the bank. The Bank of Rutland's money became commonplace in the community. On the agricultural scene, the breeding and raising of Merino sheep provided an excellent source of wool for New England's woolen mills. The Vermont breeds of Merino sheep also gained an international market. The east side of Main Street was dominated by the courthouse and post office, and included stores, shops and inns. It was around the town common that Rutland's political, social and economic life flowed during "the quiet years. " The pastoral character of Rutland in this era is well illustrated in an 1837 painting of Rutland by Asher Durand, a Hudson River artist. Rutland's village was filled with craftsmen. This Lord and Goddard clock was manufactured at the northwest corner of the intersection of West and Main Streets. Other craftsmen made furniture, shoes and boots, hats, saddles, jewelry, silverware, pottery and other goods. Marble quarrying on a large scale began in the late 1830s and in the 1840s. In 1851 a Rutland artist, James Hope, painted at least three versions of the West Rutland quarry of Sheldons, Morgan and Slason. This quarry was one of the oldest, largest and most productive of the Rutland marble quarries. In the 1850s Rutland became the railroad center of Vermont. The Rutland Railroad station, machine shop, round house and other facilities were located to the west of the town center. Lines ran north and south and west and southeast. The railroads arrived just in time to aid in the growth of the marble industry. As Rutland grew in population the Rutland Academy, later the Union High School, played an ever more important role in educating a population for a growing commercial and industrial economy. The growing railroad activities caused a new downtown to develop nearer the railroad complex. This meant that new public and private buildings, including a new courthouse and post office, were built near the railroad and not adjoining the old town common. A severe fire at the top of West Street hill in 1857 must have given opportunity and/or encouragement to many businesses to move from the old uptown to the new downtown. Heavy industries, such as the Rutland Foundry and Machine Company, began to locate in the immediate vicinity of the railroad. In the Civil War, Rutland provided two leaders of stature from the same family: Lt. Col. William W. Y. Ripley, a leader of sharp shooters, and his brother, Gen. Edward H. Ripley, who led the occupation of Richmond, Virginia. Numerous other Rutland men, black and white, served with distinction. In 1870 the post-war community celebrated Rutland's 100th Anniversary of its first settlement. In 1870 Rutland was the railroad crossroads of Vermont. It was also a developing industrial community as well as the center of the world's largest marble business. In 1877 the Howe Scale Company opened a plant in Rutland after moving from Brandon to Rutland to share in Rutland's transportation advantages and its numerous and skilled industrial workforce. In the 1880s, nearly 20 years after the end of the Civil War, a G. A. R. Memorial Hall was built on West Street in Rutland to honor the Rutland area men who served in the Civil War. But a division of the original Town of Rutland was about to occur. In 1886 Proctor and West Rutland became separate towns and in 1892 Rutland City separated from Rutland Town. What was once one had become four communities. By 1885 the growing pressures of urbanization led to the development of a horse-drawn trolley system that looped around north and south Rutland and also went to West Rutland. However, transportation improvements could not prevent a fracturing of the original town. In the 1890s Rutland became a cultural center for music, literature and theater. Julia Ripley Dorr was instrumental in developing local appreciation for the arts, especially among women. Her father had built the Rutland Opera House and after a fire destroyed it he rebuilt it. Julia composed an ode for the opening of the rebuilt Opera House. She was personally acclaimed by New England's late 19th Century writers of note, for both her poetry and prose. She was a strong patron of the Rutland Free Library and arts and literature in Rutland in general. In 1913 George Chaffee built the Playhouse, another new theater seating nearly 1,000 people. This theater opened in 1914. Politically Vermont was a Republican state but within the state, and in Rutland, in particular, there were two principal factions in the Republican Party. One was led by Redfield Proctor, who was governor of Vermont from 1878-1880, Secretary of War in the Harrison cabinet and later Senator from Vermont. The other was led by Percival Clement who had headed the Rutland Railroad in the 1890s and became owner of the Rutland Herald. After numerous political contests with the Proctor wing of the Republican Party, Clement was elected Governor in 1918. On the Rutland economic scene the Vermont Marble company organized by Redfield Proctor combined the various Rutland marble interests into the world's largest marble industry with complexes located in Proctor and West Rutland. In February 1906 the downtown of Rutland was threatened by Rutland's single greatest fire. The Bates House, with retail outlets on the street level, was totally demolished as were adjoining buildings to the north on Merchants Row and east halfway up Center Street. Throughout the battle against the fire there were fears that all of downtown Rutland might burn. In 1894 the horse-drawn trolley was replaced by the electric trolley. In the early 20th Century the trolley system expanded its reach to Lake Bomoseen, Castleton and Fair Haven. In 1913 the system carried over 3 million passengers. But competition was coming in the form of the auto. By 1923 the trolley system was abandoned and the auto was king of transportation. During World War I Rutland's energies were concentrated on the home front in its industries and war bond drives. Its wives and mothers increasingly became involved as their young men marched off to Europe. In November 1927 floods hit Vermont and Rutland was no exception although it did not suffer as much as some other communities. This photo of the 1927 flood in Rutland shows the depth of the waters on Strongs Avenue. But water was not always a threat. In 1929 Rutland built a municipal swimming pool on the western side of North Main Street. This municipal facility became not only a notable public recreation site but also a popular postcard view. In 1929 the community also opened a new high school building on Library Avenue. Rutland and Vermont were not hit as hard by the Depression as the rest of the country. But that did not mean that there were no hard times for many individuals and families. This 1930s view shows Civilian Conservation Corps (CCC) recruits arriving at the Rutland Railroad station for CCC camp. With World War II on the horizon many Rutland young men volunteered or were drafted and most have memories of departing from the old Rutland Railroad Station.A Japanese two-man submarine, on display in Depot Park, encouraged Rutlanders to participate in a war bond drive. The Rutland honor roll in the background may have been an even greater motivation to participate. After the end of World War II, Rutland was struck with an unexpected disaster. After a heavy rain on a June day in 1947 an overflow of water from the Chittenden dam caused the earthen dam in East Pittsford Pond to give way and sent a wall of water down East Creek leaving great destruction in its wake. At the intersection of West Street and East Creek, the flood of 1947 destroyed a highway bridge and a railroad bridge as well as flooding the surrounding area. During the 1950s the Chamber of Commerce and the local service clubs were extremely active in improving the community. In the winter the Chamber organized an annual Winter Carnival, replete with outdoor activities, a parade and a winter Carnival Ball with Queen and Court. Joan Looker, the 1955 queen, appeared on the Dave Garroway national TV show on NBC to promote Rutland and Vermont. From 1952 to 1954 the Chamber spearheaded the development of the Rocky Pond recreation area which opened to the public in 1954. Rutland outgrew its 1895 hospital and the 1927 expansion to it. In 1956 ground was broken for a new hospital on the Chaffee Farm at Allen Street and Stratton Road. In 1958 the new hospital was occupied. In 1953 passenger service on the Rutland Railroad ceased. By 1961, after a strike and a lockout, the Rutland Railroad ceased to operate. It was abandoned and its equipment sold. Against the backdrop of a city in economic difficulty, local volunteers built a Bicentennial Village in 1961 to celebrate the 200th Anniversary of Rutland's 1761 charter. The village included a blacksmith shop, a village store and numerous exhibits. Disaster struck the community again in 1973 when on a cold January evening, the Town House (the old Berwick Hotel) burned in a terrible fire. The present generation in Rutland is not without challenges but it is in a revitalization mode. The community that was once the railroad center of Vermont has seen the re-establishment of daily passenger rail connection with New York City. Rail freight still flows for specialized industries such as OMYA which has transformed the marble industry from a building stone industry to one supplying the world with calcium carbonate for its toothpastes, paper and many other products. Meanwhile the automobile, which had such a hand in the passing of railroad passenger service, and the truck, which now carries the majority of freight, have continued to make Rutland a destination community. At the end of summer every year, the Rutland Fair draws the interest and attendance of many people. Although the numbers for this seasonal entertainment are not as large in a television age as in the past, the Fair still is a landmark of the Rutland recreational season. On the other hand Rutland as a retail shopping destination has had a great rebirth with the conversion of the old railroad yard into a downtown shopping plaza which ties together the old and the new into one downtown shopping center. In West Rutland and Rutland Town additional modern shopping areas give the old Rutland community a sizeable retail economy. Rutland has been and is a prime regional location for shopping, dining and movies and live entertainment. Rutland has lost the old smoke-belching factories of the past. The industries are smaller and more diversified. One of the largest employers is the General Electric plant in Rutland Town. The restored Paramount Theater now offers a beautiful and historic setting for a great variety of live entertainment. Built in 1913 and opened in 1914, it was considered one of the finest theaters in New England. Today that glory has been restored. In the summer a Downtown Farmer's Market and evening entertainment complement the traditional Sunday and Wednesday evening concerts in the uptown city park. Set at the base of one of the premier ski areas of the East, Rutland is a great place in which to live, play and work. This great quality of life in a small town-city setting is a great attraction for thousands of visitors annually.